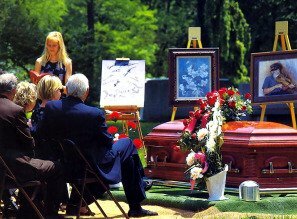 Graveside funeral services are also called Direct Burial. Commonly depicted in movies, these are funeral services in which there is not a formal viewing or ceremony except for those performed directly at the gravesite. Graveside funerals are generally briefer and less expensive than traditional funeral services but the process to arrange one is generally the same and the funeral home or cemetery can make most of the required arrangements. The first decision to be made is the selection of a cemetery and burial plot. Sometimes the deceased has already specified a cemetery or prepaid for an internment plot but if these arrangements have not been made, they will need to be done immediately. The next decision will be to determine the formality of the graveside service and if a clergy member should lead the service. A religious dedication of the grave may also be desired. See Sample Funeral Services. Decisions regarding location of the cemetery, whether to embalm and bury or cremate, date of the funeral service, who to notify, the writing of an obituary, and the creation of a funeral program all need to be completed within a few of days of death and prior to the funeral service. If the deceased is not going to be embalmed, refrigeration or a burial/cremation within 24 hours is generally required. The funeral home or the leader of the church can assist in these manners and most will have templates for obituaries and funeral programs. Often flowers are ordered as soon as these other details are arranged. Florists generally require at least two days to accommodate funeral services. Traditionally, a casket spray floral arrangement is ordered; this arrangement is specifically intended to be placed on the casket during the funeral. Other flower arrangements are often ordered by friends and family and placed at the graveside for the funeral service. Flowers can be very expensive and many individuals choose to ask for donations to a charity, hospital, hospice, scholarship fund, or bank account in lieu of flowers. Calling family members to invite them to the funeral should also be done as soon as possible. While talking to them ask if they would like participate in the funeral service by being a pallbearer, offering a reading of poem, singing a song, playing an instrument, offering a prayer, offering a story about the deceased, or an eulogy. Sometimes the deceases may have specifically requested someone to sing or otherwise participate and this desire should be communicated to the family members. However, when making these arrangements keep in mind that most of the people attending the funeral will be standing around the gravesite and the service should be kept brief.